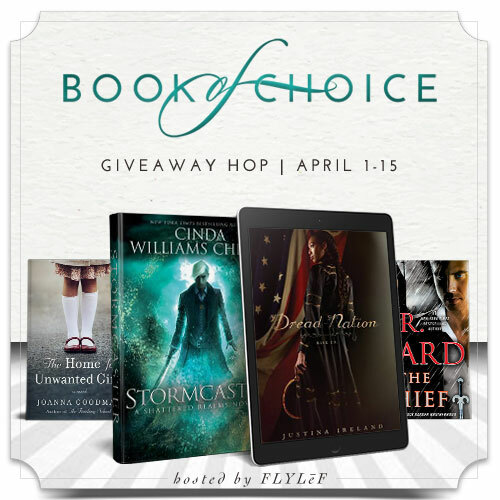 Enter this giveaway for a chance to win an April 2018 release of your choice worth $15. Good luck! I Have Lost My Way by Gayle Forman sounds like an emotionally cathartic story of losing love, finding love and dis­covering the person you are meant to be. A friend is urging me to read Dread Nation so I'm getting really curious about it. Plus, just look at that cover! I'm not sure of new releases but I bought a heap of second-hand books in a charity shop the other day so I can't wait to get stuck into them! There's everything from fiction, non-fiction, crime, suspense, thriller & some classics! "What's your most anticipated April 2018 read and why?" I don't know--maybe "The Home For Unwanted Girls" would be good! The New Christina Lauren book "Love and Other Words" because I love her books so much. The home for unwanted girls as it sounds like a brilliant read and just my kind of book. Stormcast! I've read a few of this author and she's fab! They all are. I love all genres of books. I'm looking forward to Twisted Prey by John Sandford -- he's one of my favorite authors and I LOVE the Lucas Davenport series. I'm looking forward to Dread Nation because of the characters of color featured and its historical nature. Stormcaster by Cinda Williams Chima because I've read the other books and enjoy this story. I'd like to read The Home For Unwanted Girls. Jennifer Ashley's Midnight Wolf, because I love her books and I love this Wolf series!! I'm looking forward to reading Leah on the Offbeat by Becky Albertalli. I am about to start Godsgrave!! I just finished Nevernight and loved it! Lizzie because it sounds cute. Pelican Point by Irene Hannon. She is one of my must read authors. My most anticipate April 2018 read is Varina by Charles Frazier because I've read favorable reviews of this book from sources I trust. I'm looking forward to Christopher Moore's Noir. His books never fail to make me laugh. I am looking forward to The Thief by J.R. Ward because I love her Black Dagger Brotherhood series. The Thief by JR Ward. I love the BDB series. I cant wait to read I Have Lost My Way by Gayle Forman. It looks really intense! My Dear Hamtilon by Stephanie Dray & Laura Kamoie because their previous book together has been a top favorite of mine. The next book in The Bone Season series by Samantha Shannon, as they are so exciting! I quite fancy You Are Awesome by Matthew Syed. I'm not usually into self-help books, but I could use some confidence bui;lding at the moment. Stormscaster because I love the first two books!!! I can't wait to read Needing Him by Kennedy Fox because I loved the first book in the series and I can't wait to read this next installment.